There are 2 blood flow problems that cause a stroke. 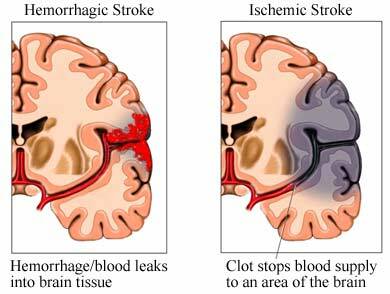 Strokes may be ischemic or hemorrhagic. An ischemic stroke is caused by a blocked blood vessel. It is the most common cause of stroke. A hemorrhagic stroke is caused by a ruptured blood vessel. A blockage in a small blood vessel will affect a smaller area of the brain. A blockage in larger blood vessels will block flow to many smaller blood vessels. This will affect more of the brain. Symptoms occur suddenly. Exact symptoms will depend on the part of the brain that is affected. Rapid treatment is important to decrease the amount of brain damage. Brain tissue without blood flow dies quickly. A physical exam will be done. The doctor will look for muscle weakness, visual and speech problems, and problems with basic movement. If possible, you will be asked about your symptoms and medical history. Some will receive a group of drugs called thrombolytics. These medicines can rapidly dissolve blood clots. They are often given by IV, but can also be delivered directly to the blood clot. These medicines need to be given within hours after the start of symptoms to be most effective. That is why it is important to get medical help right away if stroke symptoms develop. Aspirin and other medicine may be continued to decrease the risk of future blood clots. This may prevent future strokes from occurring. Include fish in your diet. Drink alcohol only in moderation. This means no more than 1-2 drinks per day. Check blood pressure frequently . Follow your doctor's recommendations for keeping it in a safe range. Take a low dose of aspirin if your doctor says it is safe. Seek medical care if you have symptoms of a stroke. Seek care even if symptoms stop. Castella CR, Jagoda A. Ischemic stroke: advances in diagnosis and management. Emerg Med Clin North Am. 2017;35(4):911-930. Ischemic strokes (clots). American Stroke Association website. Available at: American Stroke Association website. Available at: http://www.strokeassociation.org/STROKEORG/AboutStroke/TypesofStroke/IschemicClots/Ischemic-Strokes-Clots%5FUCM%5F310939%5FArticle.jsp#.Vk3ipE2FPIU. Updated April 26, 2017. Accessed November 10, 2017. Long-term management of stroke. EBSCO DynaMed Plus website. Available at: http://www.dynamed.com/topics/dmp~AN~T900125/Long-term-management-of-stroke . Updated March 19, 2017. Accessed November 10, 2017. Mendelson SJ, Prabhakaran S. Pace of progress in stroke thrombolysis: are hospitals running to stand still? Circ Cardiovasc Qual Outcomes. 2017;10(1):e003438. Stroke (acute management). EBSCO DynaMed Plus website. Available at: http://www.dynamed.com/topics/dmp~AN~T143427/Stroke-acute-management . Updated November 8, 2017. Accessed November 10, 2017. 11/20/06 DynaMed Plus Systematic Literature Surveillance http://www.dynamed.com/topics/dmp~AN~T143427/Stroke-acute-management : Mas JL, Chatellier G, Beyssen B, et al. Endarterectomy versus stenting in patients with symptomatic severe carotid stenosis. N Engl J Med. 2006;355(16):1726-1729. 12/16/2008 DynaMed Plus Systematic Literature Surveillance http://www.dynamed.com/topics/dmp~AN~T143427/Stroke-acute-management : Farquhar C, Marjoribanks J, Lethaby A, Suckling J, Lamberts Q. Long term hormone therapy for perimenopausal and postmenopausal women. Cochrane Database Syst Rev. 2008;CD004143. 10/9/2009 DynaMed Plus Systematic Literature Surveillance http://www.dynamed.com/topics/dmp~AN~T143427/Stroke-acute-management : Mitchell PH, Veith RC, Becker KJ, et al. Brief psychosocial-behavioral intervention with antidepressant reduces poststroke depression significantly more than usual care with antidepressant: living well with stroke: randomized, controlled trial. Stroke. 2009;40(9):3073-3078. 3/28/2011 DynaMed Plus Systematic Literature Surveillance http://www.dynamed.com/topics/dmp~AN~T143427/Stroke-acute-management : Park Y, Subar AF, Hollenbeck A, Schatzkin A. Dietary fiber intake and mortality in the NIH-AARP diet and health study. Arch Intern Med. 2011;171(12):1061-1068. 2/7/2014 DynaMed Plus Systematic Literature Surveillance http://www.dynamed.com/topics/dmp~AN~T143427/Stroke-acute-management : Bushnell C, McCollough LD, Awad IA, et al. Guideline for the prevention of stroke in women. Available at: http://stroke.ahajournals.org/content/early/2014/02/06/01.str.0000442009.06663.48. Accessed November 18, 2014. 6/2/2014 DynaMed Plus Systematic Literature Surveillance http://www.dynamed.com/topics/dmp~AN~T143427/Stroke-acute-management : Myint PK, Cleark AB, Kwok CS, et al. Bone mineral density and incidence of stroke: European prospective investigation into cancer-Norfolk population-based study, systemic review, and meta-analysis. Stroke. 2014;45(2):373-382. 6/2/2014 DynaMed Plus Systematic Literature Surveillance http://www.dynamed.com/topics/dmp~AN~T143427/Stroke-acute-management : Imfeld P, Bodmer M,Schuerch M, Jick SS, Meier CR. Risk of incident stroke in patients with Alzheimer disease or vascular dementia. Neurology. 2013;81(10):910-919. 8/11/2015 DynaMed Plus Systematic Literature Surveillance http://www.dynamed.com/topics/dmp~AN~T143427/Stroke-acute-management : Molnar MZ, Mucsi I, Novak M, et al. Association of incident obstructive sleep apnoea with outcomes in a large cohort of US veterans. Thorax. 2015;70(9):888-895.